I love everything about coconut; the smell, taste and the overall versatility of this fruit. In recent years, we’ve learned a lot about coconut and its health benefits which is why so many people consume it as part of their daily diet. Everything from coconut oil, sugar, water, flour, and milk is used in my kitchen on a regular basis. When I had the opportunity to get my hands on Camilla Saulsbury's The Complete Coconut Cookbook, I was excited; an entire cookbook devoted to what Saulsbury describes as “the humble, hairy coconut.” This cookbook offers an overview of the health benefits, how to equipment your coconut pantry and helpful “how-to” tips for cooking with the various ingredients that are all gluten-free, grain-free, nut-free and vegan . The collection of 200 recipes ranges from breakfast, salads, soups, beverages, breads, main dishes and decadent treats. It finally feels like fall here in Arizona, so I had to go with one of the recipes that called for pumpkin. 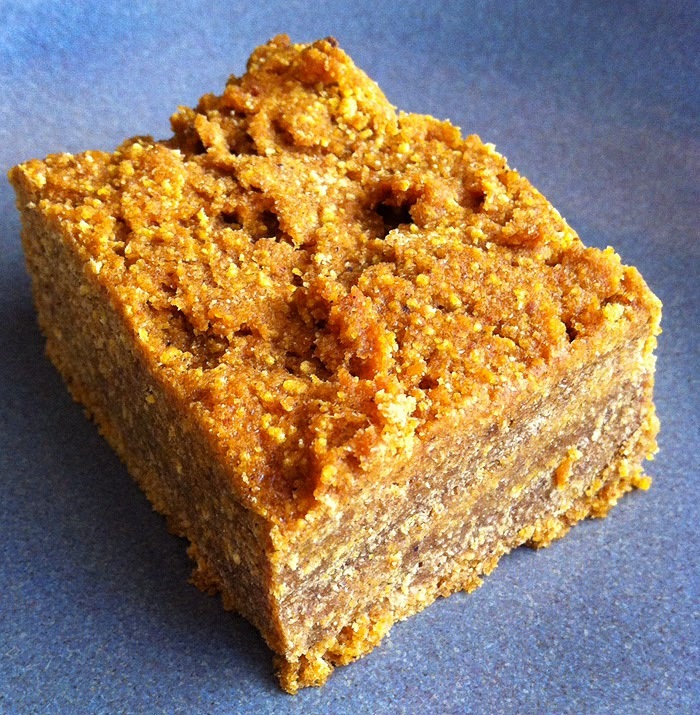 I’m also a sucker for a sweet treat, so I opted to try the Spiced Pumpkin Bars. After looking at the ingredients, I needed a little help from my friends over at Bob’s Red Mill. Their gluten-free baking options are extensive and impressive; they had the chickpea (garbanzo bean) and coconut flour and the gluten-free baking powder this recipe called for. These perfectly spiced bars turned out great. A nice healthy alternative to your traditional pumpkin pie. 1. In a medium bowl, whisk together coconut sugar, psyllium, pumpkin, coconut oil, coconut milk and vanilla until well blended. Let stand for 5 minutes to thicken. 2. In a large bowl, whisk together chickpea flour, coconut flour, pumpkin pie spice, baking powder and salt. 3. Add the pumpkin mixture to the flour mixture and stir until blended. 4. Spread batter evenly in prepared pan. 5. Bake in preheated oven for 40 to 45 minutes or until a toothpick inserted in the center comes out clean. Let cool completely in pan on a wire rack. Use liner to lift from pan. Cut into 12 bars. This is so timely. I just got back from lunching with a friend who cannot have gluten and we talked about chickpea flour. Here now is a perfect recipe for her (and me) for the season. These look great. I think I have everything to make them too. yeah. I have not made any sort of pumpkin bar or bread this fall for some reason! This inspires me! Wow, that photo almost knocked my socks off. :) They look so yummy!!! thanks for sharing! Wow, these look fantastic and sound very easy to make. I am not the greatest baker, so I really am only interested in recipes that are pretty much foolproof. Hurray for pumpkin season! The best time of the year! :-) These look great! I love everything about coconut too! These look perfect, seriously. Why have I not made pumpkin bars yet? Must remedy that, and pronto. Going to try this! Theresa, I want these by the dozens. We need some kind of food exchange program. I haven't baked with coconut sugar before and I love how this recipe uses coconut in different ways!